Night Sweats are very common in fibromyalgia, and to a lesser degree in the general population. In two recent newsletters I talked about the role of reproductive and adrenal hormone deficiencies as causes of night sweats. Today I'll discuss another very common problem that triggers night sweats: infections. Candida is an overgrowth of yeast/fungi (I use the two terms interchangeably in this article). It is a major issue In fibromyalgia and the general population. Unfortunately there's no medical test for this, so a diagnosis can only be made clinically — which to most doctors means that it doesn't exist. And you can't diagnose and treat something if you don't even know it exists! So how can you tell if you have it? One way is that if you have nasal congestion, sinusitis or irritable bowel syndrome without any apparent causes, then there's a reasonable chance you have Candida overgrowth and should treat it to bring its level in your body back into balance. This not only helps improve your other symptoms, but also helps eliminate your night sweats and even helps decrease your pain, fatigue and brain fog. So balancing Candida is critical. Now let's discuss how to do it! Candida occurs primarily in your gut. It creates toxins, sparks inflammation, triggers chronic sinusitis and spastic colon, further weakens your immune system, and generally causes you ill health. If you have CFS/fibromyalgia, I recommend you just assume you have Candida and address it. Rebalancing Candida often dramatically improves your CFS and fibromyalgia, while also making your sinusitis and spastic colon go away! It's Easy to Find Out If You Have Candida! Answer yes or no to each of the questions below. Your total score will show you the probability that you have yeast overgrowth. Simply total the point values shown in parenthesis for each of the questions you answer "yes" to. Add your scores. If the total is 70 or more, then you should consider treatments to rebalance Candida. Candida is a normal part of our body's flora. So it doesn't need to be completely eliminated. You just need to bring it into balance in your body. You can do that by following the four tips described below (give these at least two months to work). Probiotic supplements supply healthy bacteria to your gut, which helps balance Candida. My favorite product is called Probiotic Pearls Elite™. This supplement contains an amazing 5 billion healthy probiotic yeast-fighting bacteria, using a mix of different Lactobacillus. Unlike most other probiotics, these come in a pearl form that's formulated to resist being destroyed by stomach acid, which means more of the "friendly" bacteria actually reach your intestines. Be careful when choosing which probiotics brand to use. The supplement industry has recently begun marketing very high-potency probiotics. But there are a couple of problems with most of these. First, stomach acid kills 99% of these high-potency formulations, and dead bacteria don't put up much of a fight for you. And if too many of these get through, they can cause overgrowth of gut bacteria in the small intestine which can actually aggravate your symptoms. Research suggests that after five months you can decrease from taking one a day to just one every other day, while usually maintaining all the benefits. Coconut oil (50% caprylic acid). Grapefruit seed extract can be helpful if use the liquid form. Berberine sulfate is an excellent herb that also helps optimize blood sugar and cholesterol levels. The dose is 200-500 mg three times a day (note, however, that it can be a bit hard on the stomach). I like to start people with a caprylic acid supplement called Caprylex™. This is a special well-tolerated complex of pure caprylic acid that's easy on the stomach. Each tablet provides 400 mg of a buffered calcium-magnesium caprylate complex, equivalent to 300 mg of caprylic acid. 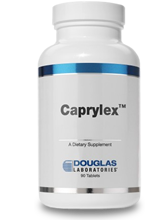 Caprylex is specially formulated to provide timed, controlled release of caprylic acid throughout the small and large intestine. Other forms can cause nasty acid reflux. Take two tablets daily on an empty stomach at least one half hour before meals. Take it for at least three months. It can be taken at the same time as the probiotic, as well as the Diflucan discussed below. The Nystatin, herbals, and probiotics will address Candida overgrowth in the gut. But they aren't absorbed and won't take care of your sinus problems if you have them. They're also not as effective in the short term as a medication called Diflucan. Ask your holistic doctor to give you a prescription for Diflucan (fluconazole) 200 mg a day for 6 weeks. Regular physicians aren't familiar with this area and generally won't prescribe it, so you'll likely need a holistic doctor to write this prescription for you. Buy a generic form to save money. If you don't have insurance coverage for this, use the free GoodRx website or their mobile app. GoodRx is a wonderful free source of medication discount coupons that can cut most prescription costs by over 90%! For instance, with GoodRx a 6-week course of Diflucan would be $54 instead of the $180 it would cost you without it. This tip isn't new, but it's crucial. Why? Because yeast eat sugar, 24/7. If you feed your yeast, they'll continue to live and multiply. If you don't feed them, they'll die off more easily. If you can't do without sweetening your foods, use a sugar substitute like Stevia. Stevia is natural and healthier than sugar. Start by cutting out sodas and fruit juices, both of which have a devastating ¾ teaspoon of sugar per ounce. Eating whole fruits is okay in moderation. Diet sodas won't feed the Candida, and Zevia has an excellent product line that you can find in health food stores and even in Safeway. Sugar-free chocolate is a delicious, healthy, sugar-free sweet treat. Russell Stover makes a good variety that you can find in most grocery stores. Abdallah Candies also makes excellent sugar-free treats. Their website mostly sells chocolate with sugar, but you can also find Abdallah's sugar-free chocolates there. Rebalancing Candida in your body is great for getting rid of night sweats. And it can also help your gut and sinuses, as well as your whole body, feel dramatically better!